A couple go camping in an area unadvised by a ranger and befriend a creepy old timer upon saving his young daughter's life. After an uneasy evening of dinner conversation with Karl Childers's father, they're rudely introduced to the man's savage vagabond son during the young woman's skinny dip the next morning. The unkept "geek" with a talent for biting the heads off chickens becomes infatuated with the woman's hair that reminds him of his deceased mother--that he killed. Things turn maniacal when the couple inadvertently kill the old man and his son takes out his rage upon the pair. Dean Crow's Backwoods is a 60/40. One of those "gray area" flicks that's content with being somewhere around 60% suspense thriller and 40% cheap horror movie. The poison of choice here is the slasher that was rapidly dwindling in popularity by the late '80s. 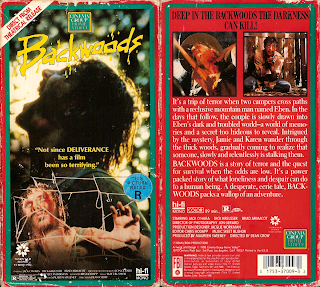 Many staple ingredients are in place including a generic maniac, a heroine suddenly turning from nervous wreck to MacGyver, plenty of boneheaded decisions, full frontal, and a scuzzy hicksploitation feel that's right at home with Joe Giannone's Madman or Jeff Liberman's Just Before Dawn years earlier. The problem is, while embracing many old conventions of slasherdom, writer/director Crow's commitment comes off halfhearted and somewhat ashamed of relying on them. Given the low budget, credit must be given to Crow for delivering the creeps. A nice atmosphere of tension settles in as we listen to every ambiguous, vaguely threatening word of the elder hillbilly's slow cadence. Scenes in which you come to question the true motivation of the old man compared to his wild son who remains locked in a shed near the ramshackle house. 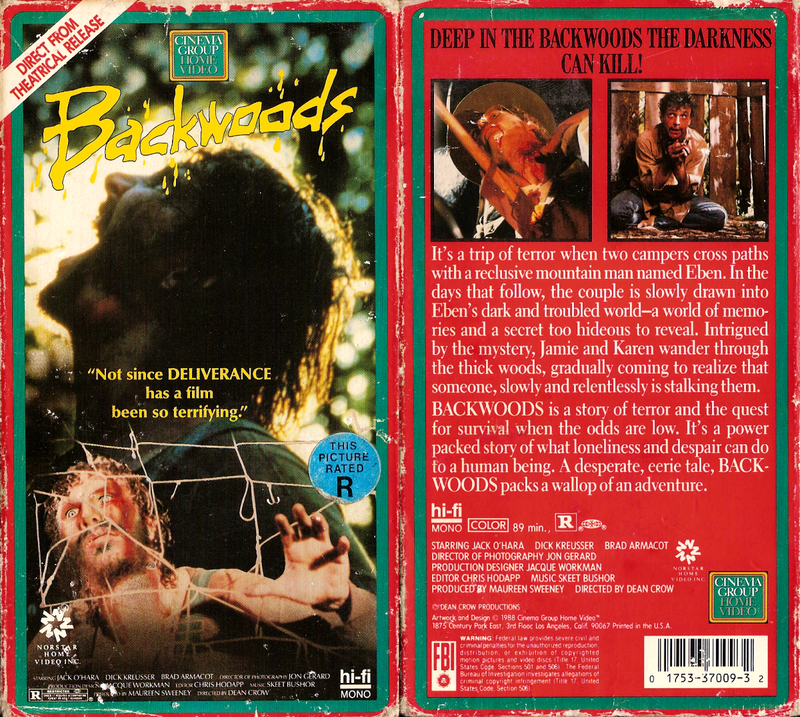 This is pretty much the lone reason to see Backwoods since, as one can probably tell, the kill count is unsatisfying low with a pool of only two or three potential victims. In fact, only one clear off-screen murder occurs aside from the "geek" spoiled on the back cover above. That's another issue, the vagrant maniac is referred to as a "geek", or a carnie working freakshows ripping chicken heads off. I'm unsure if today's newer definition was used much back in '87, but I immediately think of a pencil neck computer nerd upon hearing it. So its use here almost appears as if Crow shoehorned in the old meaning to make the picture seem smarter than it actually is. In reality, the simple use of "geek", even in the climatic kill-or-be-killed showdown, makes any believability awkward and hard-to-swallow. Then we get an even stupider surprise twist and a text definition of "geek" before the end credits. Not to say this half-and-half effort is bad per se, but why drink an O'Douls like Backwoods on an occasion were one could easily partake in the real deal?